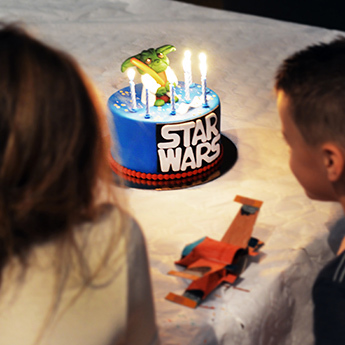 Celebrating your child’s birthday at our museum is now possible ! The House of Elsewhere welcomes birthday boy and girls every Wednesday and Saturday from 2pm to 4 pm. We offer a range of fun activities that enable a first approach to science fiction in a playful way. Build up a fantastic spaceship out of upcycled materials and discover Jules Verne’s world with our storyteller. For an imaginary trip with your friends, best suited for 7 to 12-year-old children. Discover the exhibition in a playful way through the LEGO construction game. Join the team to solve riddles and puzzles in order to reach the hidden treasure of the House of Elsewhere. A team game best suited for 7 to 12-year-old children. Invite your friends to a quest to decode the encryted messages that will allow you to escape the museum! A team game best suited for 8 to 12-year-old children. Due to organisation and security reasons, we can only allow up to 10 children for this activity (including the birthday boy or girl and the siblings). In order to ensure a smooth running of the activity, we ask the parents to be present during the activity.